The plans for a Museum for Richmond were first mooted in 1843 when a room was to be set aside for the purpose in the new Mechanic’s Institute (the present Dome building on the Quadrant). However, this never happened, and it wasn’t until 1983, when a group of local residents under the leadership of John Cloake, a local historian, that plans were revived. It was obvious that a town with the rich history of Richmond should have a Museum to tell its story. The Museum found a home on the second floor of the renovated Old Town Hall. 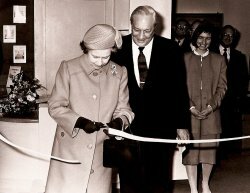 Queen Elizabeth II formally opened the Museum when she opened the new Riverside Development on 28th October 1988. It was designed by ‘Robin Wade and Pat Read Design Associates’. Robin Wade is a local resident and well-known museum designer who had been responsible for designs for museums such as the Ironbridge Gorge Museum and galleries at the Science and British Museums. The collection covers the area of the old pre-1965 Borough of Richmond which comprised Richmond, Ham, Petersham and Kew. The foundation of the collection came from the Borough collection then stored at Orleans House, but has grown considerably over the years. 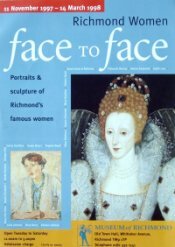 It should also be noted that, through a wide-ranging education service and special exhibitions, the Museum embraces the whole area of the present London Borough of Richmond upon Thames. John Cloake became the Museum’s first Chairman and Bamber Gascoigne, a local resident, its first Patron. Royal Patron: Her Royal Highness Princess Alexandra. Patrons: Sir David Attenborough, Greville Dare, Bamber Gascoigne, Lady Annabel Goldsmith, Andrew Marr, Lord Watson of Richmond. Page edited by Easywebwriter the online web builder.